Thermapool swimming pool insulation is the most effective way of ensuring your swimming pool is affordable to heat, makes the most of solar energy, stays warm all year round and has minimal impact on the environment. Thermapool insulation reduces CO2 emissions. Thermapool's incredible swimming pool insulating system was developed through a comprehensive R&D programme starting in 2003. It has changed the way the swimming pool industry thinks about insulating swimming pools. Thermapool is accredited under Defra's Carbon Emissions Reduction Target. There is no doubt that owning a Thermapool is an investment in your quality of life whilst increasing the value of your home, reducing your swimming pool running cost and helping the environment. What is a Thermapool? It is a range of unique ‘patented' insulated solutions which saves you money! Designed for insulating existing swimming pools, new swimming pools, above ground or in ground, tiled or liner swimming pools, Jacuzzis, Spa's and even natural swimming pools. 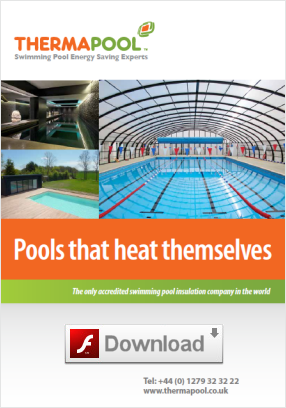 Thermapool have years of experience in reducing energy cost for clients with luxury needs. We've also developed a Thermapool Panel Pool Kit the all-in-one liner swimming pool building kit which not only insulates, but cuts down on the building time it normally takes to create your swimming pool which removes the need for a traditional concrete structure by using our ‘Formula One' wall building technology. Thermapool also developed ThermaCover the best solar swimming pool cover which heats your water for free. "Thermapool insulated outdoor swimming pools fitted with our clear Solar Pool Cover, will not need to be heated when conditions are warm and sunny. Guaranteed"
Call us now to find out how you can receive a Swimming Pool Insulation Grant. Please email us at info@thermapool.co.uk to discuss your project - We deliver worldwide!